Over 50 years of experience playing in working bands on both the electric bass and guitar. He has taught a variety of students to play beginner guitar ranging in ages from 8-30 years old, and is a musician with a huge repertoire of songs and styles who has the ability to master songs that students wish to play. He is a player with great rhythm and a passion for playing and teaching students to play music. He is a seasoned performer who has played with a variety of bands with styles ranging across the music spectrum to include rock n' roll, country, rhythm and blues, blues, rockabilly, swing, folk and jazz. An experienced player who has jammed with a large number of local musicians in a variety styles. Employs a solid teaching approach based on the Mel Bay method of teaching guitar with an emphasis on fundamentals, having fun and learning songs that the student wants to play. 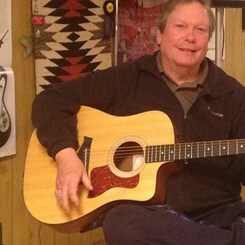 Request Lessons with Robert Churchwell today!